CALMIT develops and uses models and remote sensing techniques to monitor water quality and vegetation status. Analyses that use remote sensing are equally valuable for aquatic and land-based projects. Which remote sensing techniques provide effective means of monitoring stresses and development in plants via reflection and absorption of light? How can the complex interaction of light in vegetation (which is highly dependent on the direction and quality of the light, the angle of view and the amount and display of leaf material) provide information on plant status? Gross Primary Production (GPP) responds to the canopy light environment; changes in GPP are often accompanied by changes in leaf and canopy optical properties. How can we assess changes in GPP and ET caused by variations in environmental and biological drivers imposed by climate change? How can remote sensing approaches extend the results of surface flux measurements and model predictions of important ecosystem level processes such as GPP and ET? A combination of leaf- and soil-level measurements and ground- and satellite-based sensor platforms at AmeriFlux sites along with quantify impacts of diffuse light and stress (plant photoprotective mechanisms) and their interactions with plant phenology will be essential in understanding and improving remote sensing approaches to integrate from the leaf level, through canopy scales, to regional (county, state, multi-state) levels. How can remote sensing techniques be used to monitor phytoplankton density, pigment composition, and suspended matter in lakes, reservoirs and coastal waters? 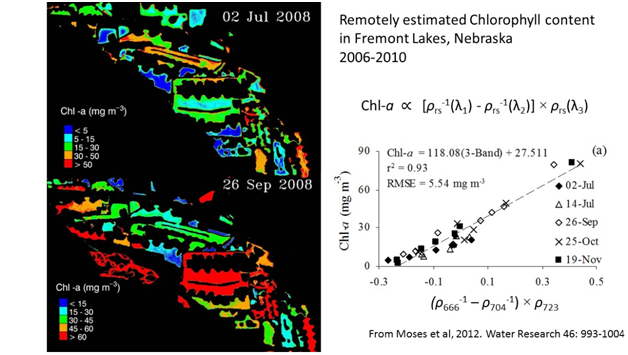 Red and near infra-red (NIR) reflectances have been shown to yield accurate estimates of chlorophyll-a concentration in turbid productive and surface waters without the need for atmospheric correction at field- and airborne-scales, facilitating estimation of global algal productivity assessment from satellite data. How can we assess aquatic "health" from remotely sensed data? Greater concentrations of blue-green algae (cyanobacteria) produce higher chlorophyll concentrations and phycocyanins, which can be detected via remote sensing. Highly dense toxic algal blooms produce spectral features that can be used to estimate the "health" of aquatic resources. By quantifying cyanobacterial density, early warnings can be provided to the public for affected freshwater systems. Canopy photosynthesis drives the exchange of CO2 and water vapor between the earth’s surface and the atmosphere – key interactions of vegetation with the environment. Typically, as vegetation stress increases, plant canopy CO2 uptake and water vapor emission decrease due to decreases in photosynthesis (and productivity), increases in respiration, and changes in stomatal conductance. Plants under stress have particular spectral signatures caused by a number of photoprotective mechanisms reducing light absorption (through physical changes such as leaf movement, leaf rolling, and chloroplast avoidance movement), and thus change canopy reflectance; leaf surface temperature increases with stress because of reduced transpiration. Changes in the optical and thermal signatures provide a means of detecting canopy stress using remote sensing methods. 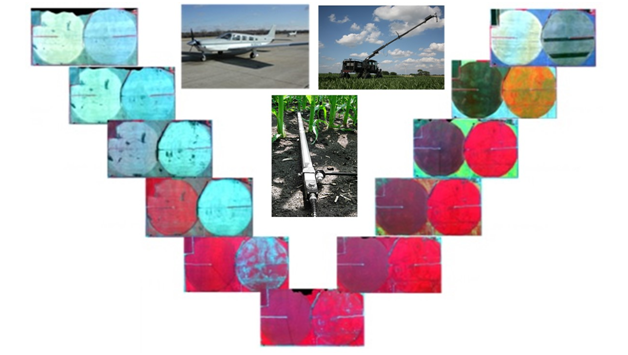 Image: Various spectral reflectance values in a corn crop. Spectral data are best analyzed at varying scales. CALMIT researchers use satellite, airborne, canopy-level, and ground level reflectance data. To assess water quality in Nebraska’s 2500+ lakes and ponds, CALMIT is pioneering new techniques for using aerial and satellite remote sensing. Upwelling radiance of water contains information on the concentrations and composition of dissolved and suspended substances in water, and is the "raw material" for remote estimation of concentrations of water constituents. Here we focused on spectral features of the upwelling radiance determined by chlorophyll a absorbance and scattering by phytoplankton cells. Image: Relative densities of algal phycocyanin as indicated by a spectral trough near 625 nm. Warmer (red) colors indicate denser algal populations. Gitelson, A. A., Peng, Y., Arkebauer, T. J., & Suyker, A. E. (2015). Productivity, absorbed photosynthetically active radiation, and light use efficiency in crops: Implications for remote sensing of crop primary production. Journal of plant physiology, 177, 100-109. Gitelson, A. A., Peng, Y., Viña, A., Arkebauer, T., & Schepers, J. S. (2016). Efficiency of chlorophyll in gross primary productivity: A proof of concept and application in crops. Journal of Plant Physiology, 201, 101-110. Moses, W. J., Gitelson, A. A., Berdnikov, S., Bowles, J. H., Povazhnyi, V., Saprygin, V., Wagner, E., & Patterson, K. W. (2014). HICO-Based NIR–red models for estimating chlorophyll-a concentration in productive coastal waters. IEEE Geoscience and Remote Sensing Letters, 11(6), 1111-1115. Moses, W. J., Gitelson, A. A., Perk, R. L., Gurlin, D., Rundquist, D. C., Leavitt, B. C., Barrow, T. M., & Brakhage, P. (2012). Estimation of chlorophyll-a concentration in turbid productive waters using airborne hyperspectral data. water research, 46(4), 993-1004. Sakamoto, T., Gitelson, A. A., Wardlow, B. D., Verma, S. B., & Suyker, A. E. (2011). Estimating daily gross primary production of maize based only on MODIS WDRVI and shortwave radiation data. Remote Sensing of Environment, 115(12), 3091-3101. Yacobi, Y. Z., Köhler, J., Leunert, F., & Gitelson, A. (2015). Phycocyanin‐specific absorption coefficient: Eliminating the effect of chlorophylls absorption. Limnology and Oceanography: Methods, 13(4), 157-168. Zygielbaum, A. I., Arkebauer, T. J., Walter-Shea, E. A., & Scoby, D. L. (2012). Detection and measurement of vegetation photoprotection stress response using PAR reflectance. Israel Journal of Plant Sciences, 60(1-2), 37-47. Creation of knowledge and development of human capital and leadership for the advancement of the State of Israel and all humanity. Measuring carbon, water, and energy flux across the Americas. Adding spectral measurements to flux tower data across the world.